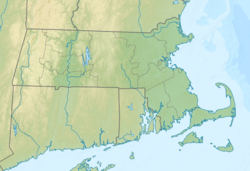 Great Quittacas Pond is a lake, reservoir, or pond within the towns of Lakeville, Middleboro, and Rochester, in southeastern Massachusetts. It shares its waters with Pocksha Pond and possibly nearby Little Quittacas Pond. These lakes provide a source of drinking water to the city of New Bedford, the largest city in southeastern Massachusetts.